Are you bored with banging out blue blankies for your buds who are birthing boys? 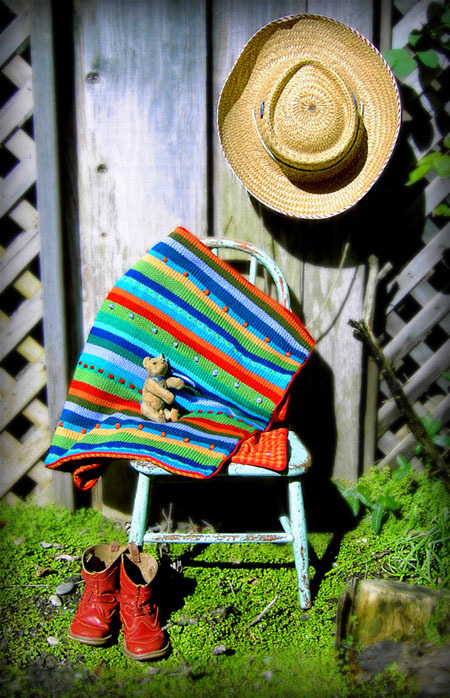 This wild and wonderful blanket full of bold colors and dazzling stripes will add bling to any rug rat's wardrobe, boy or girl. Weaving in the ends as you go makes an easy job of the stripes, and a soft cotton backing makes this blanket great for playtime or napping. Weave in the yarn ends as you go; when you finish a color stripe, weave in the two ends at the beginning of that stripe before proceeding to the next color stripe. Using gingham fabric for the lining makes the entire project much easier. Use gingham checks to align stripes evenly on each side of the knitting when assembling the blanket, and then again when working embroidery. Using color #23466 Butternut CO 158 sts. Work in stockinette st, following stripe pattern from chart. Work rows 1-94 of stripe pattern 3 times (282 rows). BO all sts. Use yardstick and pencil to measure and trace a rectangle measuring 30 by 40 inches on the lining fabric. Add 0.5 inches to each edge for seam allowances, and cut out lining. 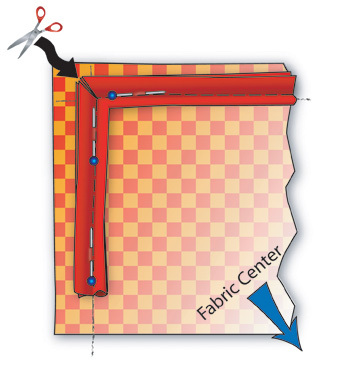 Pin Maxi Piping to right side of fabric, with piping side facing toward center of fabric piece, so that stitching of piping lays along pencil line (see diagram). Sew piping to lining, clipping the corners as shown. 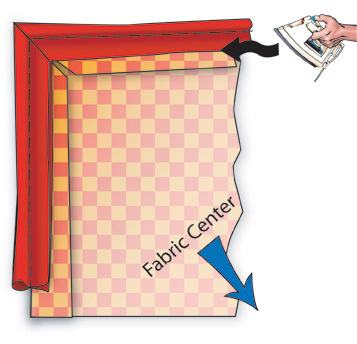 Place fabric on ironing board wrong side up, fold over seam allowances as shown, and press. This will make the piping stick out just past the edges of the lining on the right side. Mark center of each side of fabric lining with a pin. Mark center of each side of knitted blanket with a stitch marker. Lay lining on table, wrong side up, and place knitted piece on top, right side up. Pin together, matching center points and corners on each side, using gingham checks to align stripes on either side and ensure that the blanket is sitting straight on the lining. 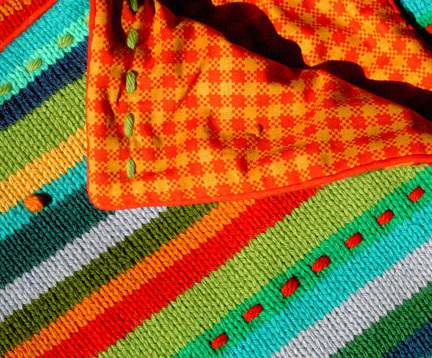 Slip stitch blanket to lining, concealing stitches in seam between fabric and piping on lining. 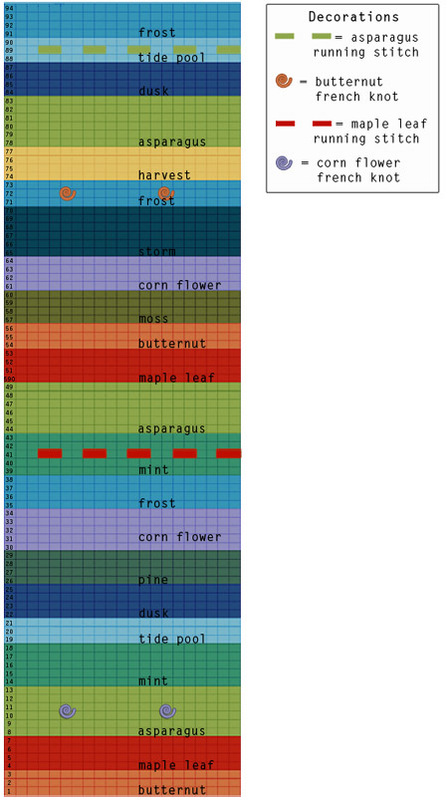 Work embroidery as indicated on stripe pattern chart. See directions below if you are unfamiliar with these embroidery stitches. Use large embroidery needle and a doubled strand of yarn. Tie a knot at the yarn end, and, on right-hand side of blanket, insert the needle into the center of a stitch several stitches away from the beginning of the row. Bring the needle out at the beginning of the row, and pull the yarn through and allow the knot to slip to the inside of the blanket by passing through the center of the first stitch. Working right to left, sew over two stitches and then under two stitches, passing through both knitted and fabric portion of blanket and aligning stitches on back with gingham checks to ensure that sewing is straight. At end of row, pull yarn taught, make knot in end and pass knot through to inside of blanket. Clip yarn, and pull ends to inside. Use large embroidery needle and a doubled strand of yarn. Tie a knot at the yarn end, and insert the needle into the center of a stitch close to the beginning of the row. Bring the needle out on blanket top between the sixth and seventh stitches, and pull the yarn through and allow the knot to slip to the inside of the blanket. Now you will make a stitch to secure the fabric backing to the blanket front, and then you will make a French knot over the securing stitch. To make the securing stitch, Pass needle over the top of stitch seven, and insert from top of blanket between stitches seven and eight, passing through both knitted and fabric layer of blanket. Pull yarn all of the way through blanket. Loop needle back and insert again from bottom of blanket between stitches six and seven again, and pull yarn through. In this way, you secure the fabric backing to the blanket. Make French knot over securing stitch by looping yarn around needle twice (starting with the blanket end of the yarn wrapped around the eye end of the needle) and then inserting needle between stitch seven and eight; this time, however, do not penetrate the fabric backing, rather, run yarn through inside of blanket, passing under the next 8 stitches. Bring it out eight stitches later at between the eighth and ninth stitches to make the next securing stitch and French knot. Make a new securing stitch and French knot in the same way every nine stitches (you will have eight un-used stitches between each knot). At end of row, pull yarn taught, make knot in end and pass knot through to inside of blanket. Clip yarn, and pull ends to inside. As a child, Kristin Goedert spent much of her time making stuff, from hats for soft-boiled eggs to sock monkeys, doll clothes to pot holders. Now that she is a grown up (or so they say) she puts her creative talents to good use as a graphic designer and owner of Kristin Goedert Design. 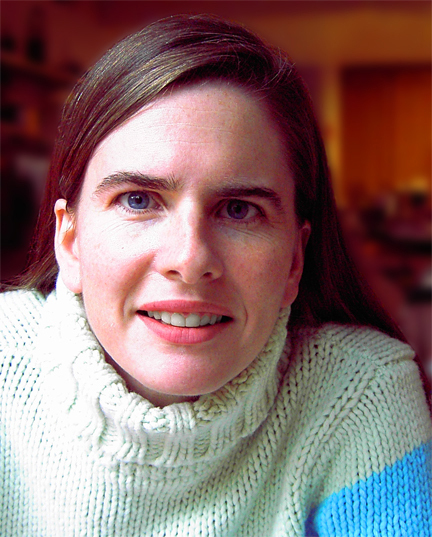 Kristin lives in the San Francisco Bay area with her husband and cats and spends as much of her free time as she can knitting, spinning, and behaving wildly.